If you are working online, chances are that you have multiple social media accounts. But managing them all could be a real pain, right? Fortunately, there are some tools that can help you have all your social media properties under control, optimizing your time and increasing productivity. 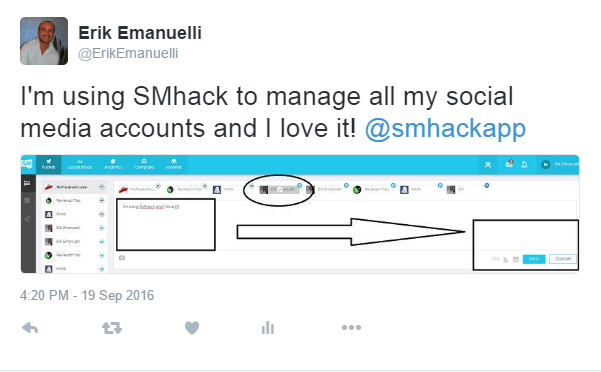 Today, I will share my experience with SMhack, an all in one social media marketing solution I’ve been testing lately. SMhack is an all in one social media managing tool for professional marketers, small businesses and digital marketing agencies, which offers several interesting features such as cross-channel posting, task management, performance analysis, activity and engagement monitoring. It’s a SaaS solution and it does not requires any additional hardware to install on your computer. To start, simply visit this page to claim your free trial (you instantly get access to all the features in SMhack’s Premium Plan for 7 days – no credit card needed) and take a look of how this tool can help you managing effectively all your social media accounts. Once you added all your social media profiles (Twitter, Facebook, LinkedIn and Instagram), you want to authorize your Google Analytics too. Let’s see the main features into details. Thanks to this feature, you can bring all your conversations from your different social media accounts under a single dashboard. You will be able to see all your posts, direct messages and mentions in one place. In the top left, as you can see, you have the option to filter the social inbox by selecting one or more of your social media profiles. You can click on each of the messages, posts or mentions visualized on your social inbox to check the details and engage with the sender. For example, if it’s a DM, you can answer directly. If that’s a Twitter mention, you can favorite or retweet. If that a Facebook post, you can like it or comment. You can also set permission levels to streamline the workflow. This essential, but important feature offers a lot of interesting options. Just type your post and decide both the social media profiles where you want to post it and the time you wish to publish it. Send it right away, push it to queue (let SMhack decide the best time to post it) or schedule it. Composing posts is very simple. Also, you can attach images or shorten URLs. You can then publish your posts in one or more of your social media accounts at the same time. There’s also a content publishing calendar that helps you monitor the content published. This is an effective way to get everything under control and schedule your week or the whole month of social media activities. The analysis is a very important part of social media marketing. You want to check the engagement with your audience, the performance of your posts or the growth of your accounts. The analytics section of your SMhack dashboard offers you all these features and many more. For each of your social media accounts, you can perform a detailed analysis. Very useful to increase reach and page likes. Also, to engage better by analyzing your previous posts. 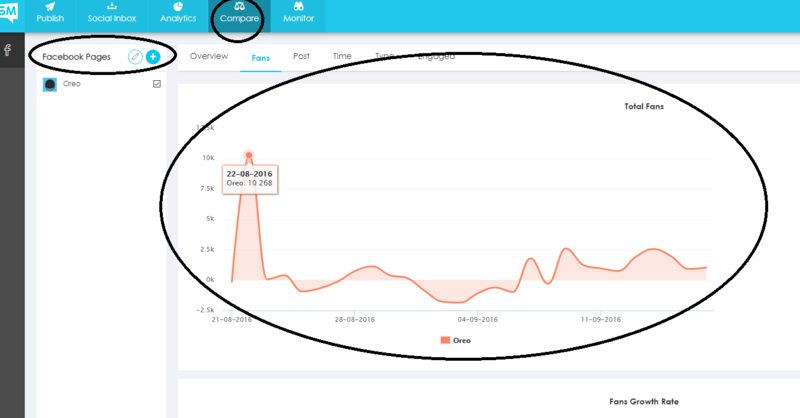 Or with Twitter, you can check the engagement of your account at the end of the day, filter it by days of the week or even by media type. You may also want to look at your most engaged hashtags. This is very interesting to create a strategy and send out content when you see the most engagement. Everything is built to help you get the most out of your social accounts, so to increase the interaction with your audience, which is one of the most important factor, when talking of social media marketing. 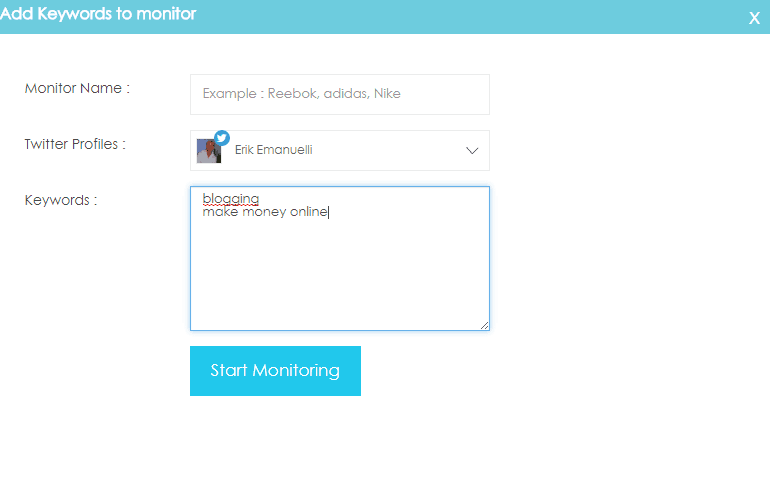 Use this section to add the social media accounts of your competitors, to monitor, track and analyze their strategies. Your competitor’s fans are growing? Analyze patterns to learn their strategy and find out which locations are being targeted. Your rival’s posts are doing great? Get your content mix right by tracking their plans. Be sure to identify their best performing posts to check what works. Are your competitor’s fans interactive? 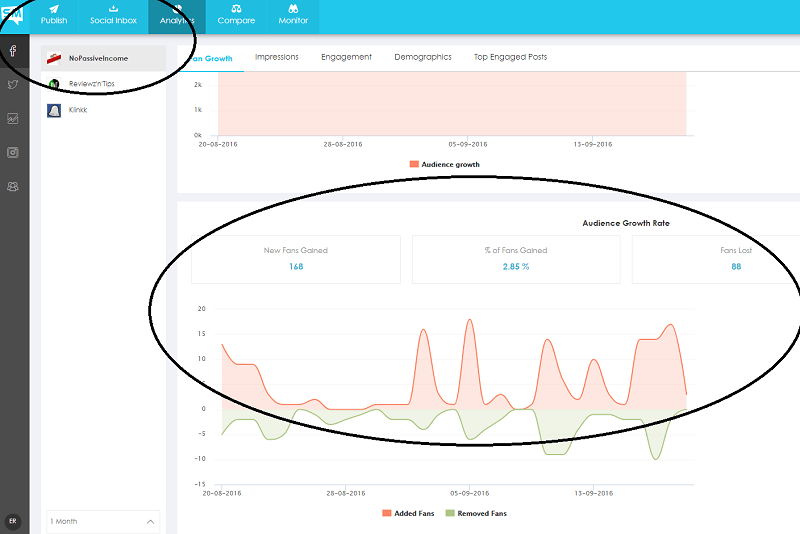 Get the pulse of their user base by analyzing their engagement (for example, the most engaged days). This is another interesting option, that you are probably looking at with a different tool. Come back after a while to check everthing was mentioned with your keywords. Excellent for monitoring your brand! 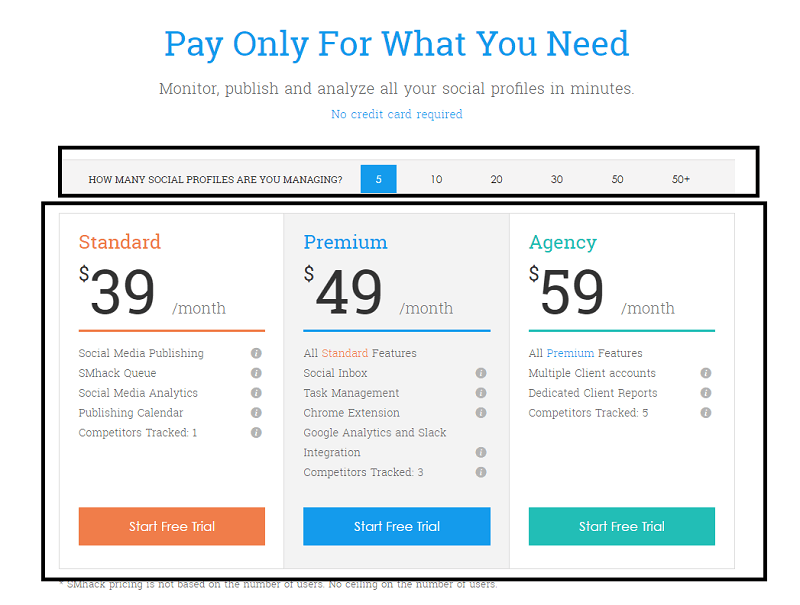 Pricing is based on plan level and number of social profiles. Three plan levels are available: Standard, Premium, and Agency. Social profiles include Facebook fan pages, Facebook profiles, Twitter handles, LinkedIn and Instagram accounts. There’s a 7-days free trial, no credit card required. Priced indicated are for a monthly plan. Annual plans have a standard 20% discount. SMhack is a powerful tool that you can use to get the most out of your social media accounts, maximizing the results with the minimal efforts. Nowadays, there are so many platforms available and what you want is aiming to simplicity and effectiveness. SMhack offers a very easy to use solution, simple to understand and with interesting features. Claim your 7-days free trial today and test it with your social media accounts. Are you going to run the free trial? Please share your experience and views in the comments below, thanks! Indeed it’s a great joy to read yet another wonderful review on your page about an amazing Tool. I am sure this tool will ease a lot of hard work. Thank you so much for sharing those valuable information features in this review. I am so glad that i curated this post on some of the IM Sites where I am a member. I am again glad that the readers there will be benefited by this informative review. good to see you and thanks for your positive feedback. Are you going to test SMhack for your social media accounts? I appreciate your shares and support! If we are working online, chances are that we have multiple social media accounts. But managing them all could be a really difficult.SMhack is really a simple social media management tool for small business and digital marketing agencies. It is also integrates with Slack. With Slack Integration, we can get all our social media conversations delivered to our Slack channel. We can also engage with our social media audience through our Slack channel. It is absolutely looking incredible with advanced features, has ability to maximize the productivity and traffic level to our websites. it’ looks like you already know SMhack. Well I have used buffer and I loved it. Seems like SMhack is also similar kinda tool with lot of additional features and I also love its design. Good to hear your feedback, Osho. Let me know how your SMhack test goes. Be sure to test it, Ryan. Thanks for this nice review for SM Hack tool. This is really a great and useful tool to manage all social media accounts. Thanks again for your great efforts. Yes, I want to test it! 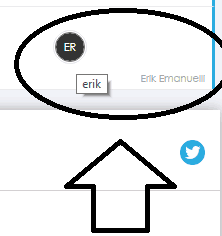 I was using Hootsuite for my twitter profile, and I found it awesome. But, after reading your review I think SM Hack is also good to use. Will give it a try! Let me know your feedback once you’ve tried SMhack, Jaideep. Can you share a video clip on SM Hack step by step to follow the process quickly? It would be great for quick learning. By the way, I appreciate you for the SM Hack tool review. A great job was done.